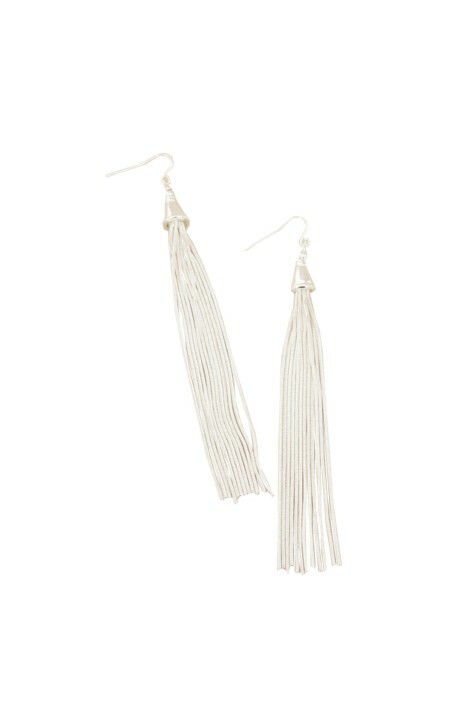 These gorgeous silver chain tassels earrings by Adorne are perfect for your next daytime function. These beautifully dramatic shoulder duster earrings feature tassels capped in a matching silver cone attached signature ear wire closure. Rent the perfect accompaniment to a sophisticated form fitted jumpsuit or perhaps a playful cocktail ruffled mini. For a super effortless glamour look, add a pair of strappy silver heels to compliment the earring style and a silver clutch pod available to hire. Keep your look super chic with soft curls throughout your hair and a pale pink lip. For more tips read our blog post ‘Blogger Inspiration: What to wear this week’.